In continuation with my earlier blog, in this blog I will talk about how to implement a recommender engine using Mahout and Hadoop. First a brief introduction about MapReduce and how some of the computational algorithm has to be re-written for taking advantage of parallel processing. Second I will talk about Recommender Algorithm to be deduced to work in Mahout to take advantages of Hadoop. Third, I will walk you thru the use case of how we can implement MapReduce Recommender engine with Hadoop and Mahout. 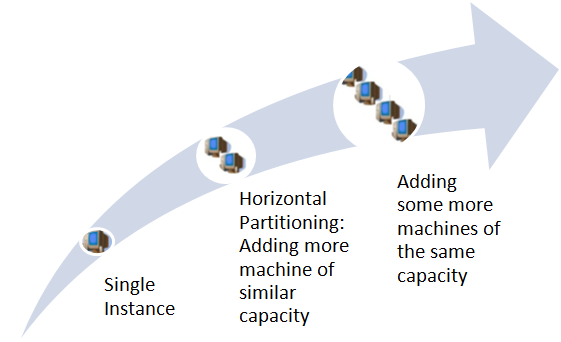 One of the fundamental principles where parallel computing can be taken advantage of is when each of the computers in a cluster can process same tasks independently without sharing any data among each other. Consider sort algorithm, they are not designed to work in a way were we chunk a large dataset and hand it off to many computer running in parallel and once the data is returned the large dataset is consolidated back. If we need to do sorting, we need to write algorithm to take advantage of MapReduce. Terasort algorithm is one of the sorting techniques which takes advantage of MapReduce. “Hello World” equivalent for recommendation problem is Netflix movie rating. The movie sample data is available here . In this test data you have a history of Users who rented Movies and rated these movies. When you rent a new movie, it will give you suggestions based on your renting pattern, as well as what other users with similar profiles are renting, this data is stored in transactional database like MySQL. We can write a batch program to the use the transaction data and move it to Hadoop filesystem. When you run Mahout MapReduce, it will return top ‘n’ recommendations. If you notice the data, it has comma separated userid,itemid,rating. It assumes you are maintaining users and items master tables in transactional database and you will combine these 2 to give the user more informative information. Let me give you a glimpse of how an Item based recommendation algorithm works using MapReduce, for more on this refer Mahout in Action by Manning, chapter 6. Now in your application, you do a data lookup to useritem table and return the Recommender results to the user. This entry was posted in BigData and tagged Hadoop on June 29, 2012 by Krishna. Recently I came across a interesting Company called Gilt which is one of the leading eCommerce company. What is interesting about it is, the whole company runs on real time analytics. Instead of I explaining what is real time analytics, click on the Hummingbird Slideshare presentation, Hummingbird Vimeo link, Hummingbird website and Hummingbird Demo to understand more. The good news is they donated the code that runs this to Git here. Setting up Himmingbird is described in the Git location. 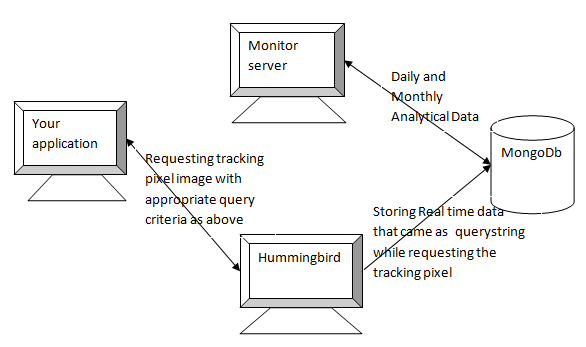 The Hummingbird tracking pixel server by default starts in port 8000 and the Monitor server start in port 8080. This entry was posted in BigData and tagged Latest in Software on June 8, 2012 by Krishna. This article touches upon various aspects of RDBMS and where RDBMS hits the roadblock in an enterprise world. This article also talks about how we can overcome this road blocks by relaxing few key aspects of RDBMS. It also talks about how a NoSQL based solution fits into this and as a popular MongoDb NoSQL solution. RDBMS evolved out of strong roots in math like Relational and Set theories. Some of the aspects are Schema validation, normalized data to avoid duplication, atomicity, locking, concurrency, high availability and one version of the truth. 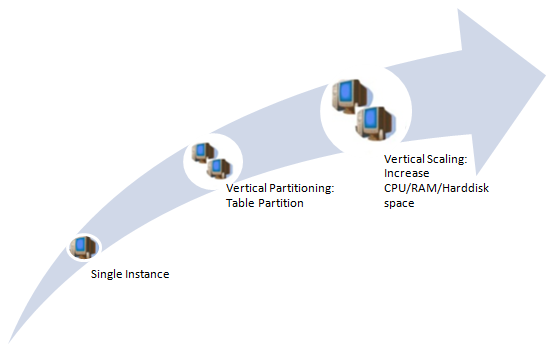 Consider that we need to store huge amount of Purchase orders and we started partitioning, one of the ways to partition is to have OrderHeader table in one Db instance and LineItem information in another. And if you want to insert or Update an Order information, you need to update both the tables atomically and you need to have a transaction manager to ensure atomicity. If you want to scale this further in terms of processing and data storage, you can only increase hard disk space and RAM. Let us consider another situation, because of the change in our business we added a new column to the LineItem table called LineDesc. And imagine that this application was running in production. Once we deploy this change, we need to bring down the server and for some time to take effect this change. Let us go back to our PurchaseOrder example and relax some of the aspects of RDBMS like normalization (avoid joins of lot of rows), atomicity and see if we can achieve some of the above objectives. Below is an example of how we can store the PurchaseOrder (there are other better way of storing the information). If you notice carefully, the purchase order is stored in a JSON document like structure. You also notice, we don’t need multiple tables, relationship and normalization and hence there is no need to join. And since the schema qualifiers are within the document, there is no table definition. You can store them as collection of objects/documents. Hypothetically if we need to store several millions of PurchaseOrders, we can chunk them in groups and store them in several instances. Because the there is no separate Table schema and and the schema definition is included in the JSON object, we can change document structure and store and retrieve with just change in application layer. This does not need database restart. Finally the object structure is JSON, we can directly present it to the web tier or mobile device and they will render it. NoSQL is a classification of Database which is designed to keep the above aspects in mind. MongoDb NoSQL database is document based which is some of the above techniques to store and retrieve the data. There are few NoSQL databases that are Ordered Key Value based like Redis, Cassandra whichalso take these approaches but are much simpler. This entry was posted in BigData and tagged Latest in Software on June 2, 2012 by Krishna. The svn codebase for this article is here. Download the latest Hadoop, Hbase and Hive from the apache websites. You can also go to Cloudera website and get the Cloudera UBuntu VM and use apt-get install hadoop, hbase and hive. It did not work for me, if you are adventurous you can try that. You can also try MapR’s VMs. Both Cloudera and MapR have good documentation and tutorials. Set HADOOP_HOME, HBASE_HOME and HIVE_HOME environment variables. Hadoop is running in 54310 port by default. This entry was posted in BigData and tagged Hadoop on May 17, 2012 by Krishna. Hadoop is primarily a distributed file system (DFS) where you can store terabytes/petabytes of data on low end commodity computers. This is similar to how companies like Yahoo and Google store their page feeds. Hive is built on the Map Reduce concept and is built on top of Hadoop. It supports SQL like query language. Its main purpose is datawarehouse analysis and adhoc querying. Hive can also be built on top of Hbase. Spring Batch is a Spring framework for managing a batch workflow. Now that you know the technology pieces and high level solution, in my next article I will write how we can implement this with working code. 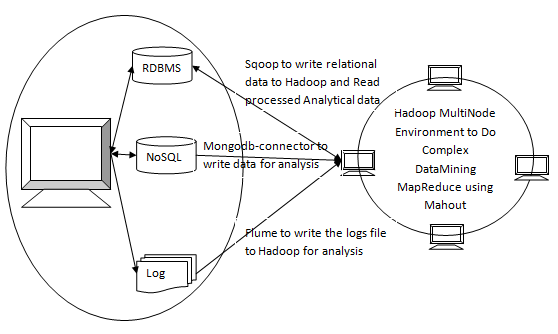 This entry was posted in BigData and tagged Hadoop on May 15, 2012 by Krishna.